On Monday, Memorial Day, we got word that Senator John McCain took a trip to Syria. McCain snuck into the war-torn country on Monday, becoming the highest- ranking U.S. official to visit since the rebellion began two years ago. The United Nations estimates more than 70,000 Syrians have died in the conflict. I would like to stress -- He went there on Memorial Day. As you read yesterday, this is what we did on Memorial day. Why did Senator McCain go to Syria, again? The rebels told McCain, a prominent critic of what he calls the Obama administration�s inaction on Syria, they wanted the United States to being supplying weapons and enforcing a no-fly zone in the country. But neither the rebels nor McCain want American troops on Syrian soil, the senator said. So, here we are again. John McCain meets with Rebels, calls them heroes good guys. 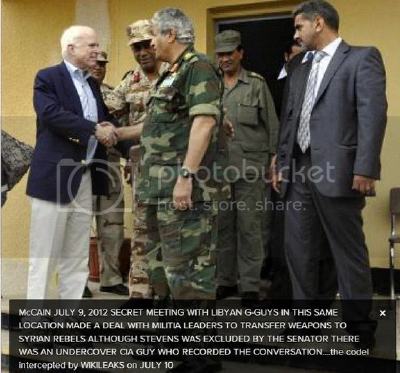 This is not the first time Senator McCain met with rebels and gave them glowing reviews. Note, these two things sound quite similar. What is interesting is that just a few months earlier McCain falsely claimed that the U.S.
armed Libyan rebels in an attempt to make the case for arming Syrian rebels. JUDY WOODRUFF: But would you also need some sort of ground forces in the area � SEN. JOHN MCCAIN: No. JUDY WOODRUFF: � because Assad�s forces are operating very much in the middle of the civilian population. SEN. JOHN MCCAIN: We would not. Putting U.S. ground forces in would be not only not appropriate, but counterproductive. We just need to arm and equip these people, the same way that we did in Libya. I am serious about this, read this. John McCain has been advocating for the United States to arm Syrian rebels for years. It's quite similar to how he advocated arming LIbyan rebels. Sadly, it appears that it is the very ones who probably killed Ambassador Stevens, Sean Smith, U.S. Foreign Service, Glen Doherty and Tyrone S.
Woods. One more time... read this. It's not conspiracy; it is not tinfoil. Senator John McCain�s office is pushing back against reports that while visiting Syria this week he posed in a photo with rebels who kidnapped 11 Lebanese Shi�ite pilgrims. The photo, released by McCain�s office, shows McCain with a group of rebels. Among them are two men identified in the Lebanese press as Mohamed Nour and Abu Ibrahim, two of the kidnappers of the group from Lebanon. A McCain spokesman said that no one who met with McCain identified themselves by either of those names. What if we were to find out that John McCain called for arming the very people that may have killed Ambassador Stevens, Sean Smith, U.S. Foreign Service, Glen Doherty and Tyrone S. Woods? When will Senator John McCain appear before the Senate to tell us what he may know? I'm just asking questions here. At a certain point, someone needs to ask specifically why John McCain has been SO vocal about the events in Benghazi. Perhaps John McCain is hoping that these events were from Pro-Qaddafi factions? So far, it doesn't appear to be the case. I propose this: It's time John McCain be brought forward to answer questions about his trips to Syria and Libya - under oath - in front of the Senate and his peers. Did he meet with rebels? Was he part of an arms deal? Did he play a part in the murder of 4 Americans in Benghazi on 9/11/2012? Could this be why he so vocal about that day? Is he trying to deflect from his responsibility for what happened? It's time these questions are answered. He's been known to hang around with rebels before. John McCain is no peace-keeper. The real question is, who is he willing to go to war with? The next question is this: Why is he so dedicated to involve our Nation with unsavory elements? Kidnappers? Killers? It's one thing to support a revolution; it's another to support assassination. To get back to my original point: John McCain puts war mongering above honoring the war dead.